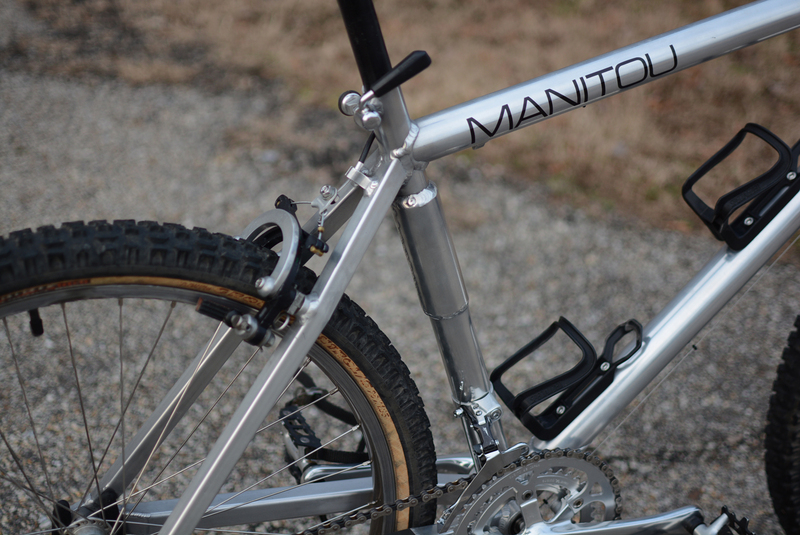 I've gone on a bit of a Manitou bender in recent months finishing four of these amazing bikes. 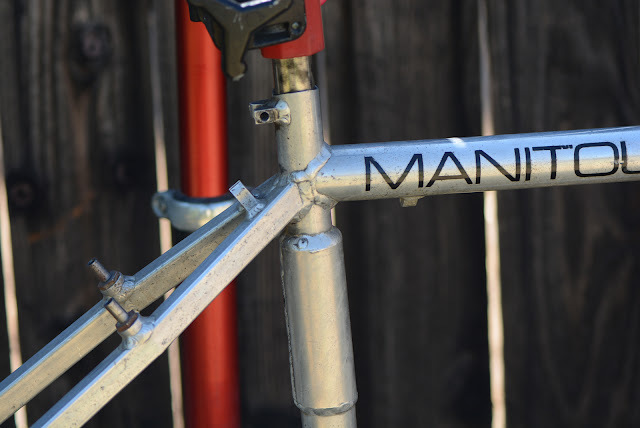 It still just boggles my mind how long I searched and waited to get my first Manitou only to now have four sitting here all built up. It's really funny how things work out. The particular frame in this post (first on the left) came from Doug Bradbury and was one of the frames sitting around his garage after he moved to Crested Butte. 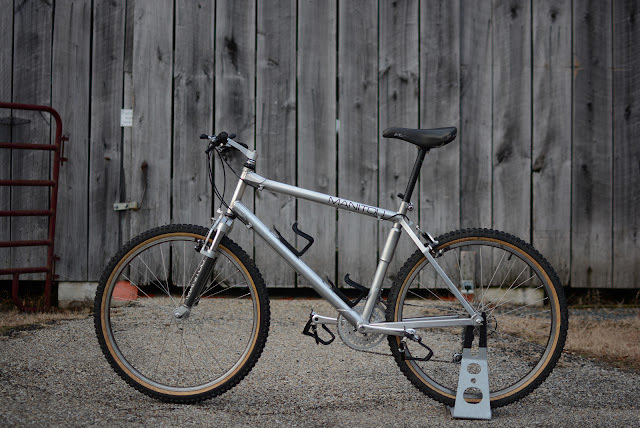 The frame is what I'd call and early-mid version of Doug's evolution featuring horizontal rear entry drop outs, box section chainstays, large gussets, externally butted down tube, pressed in bottom bracket and a necked down seat tube. 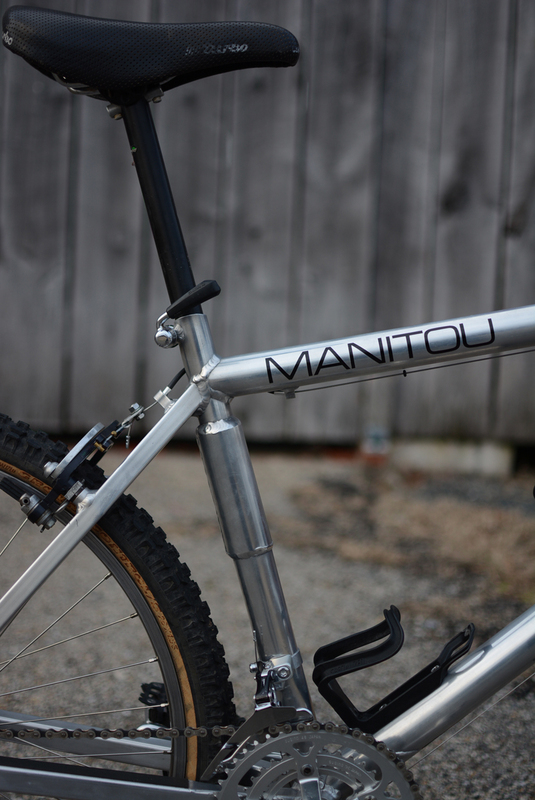 Though Manitous famously lack serial numbers those design details combined with a few date verified entries in the build log book place this bike squarely in 1989. 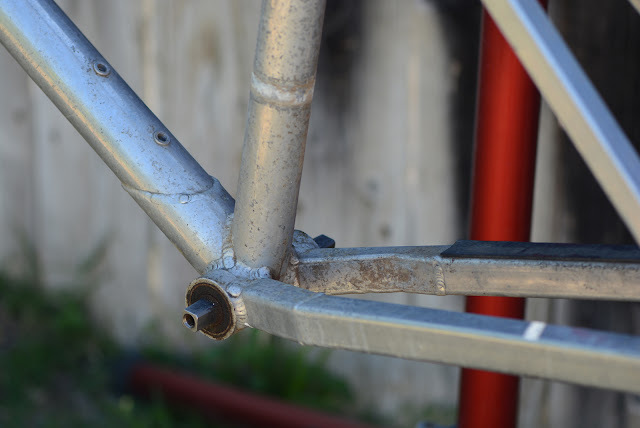 Below are a few photos of the frame as I got it from Doug, as you can see it was in pretty rough shape with a lot of oxidization all over the place. 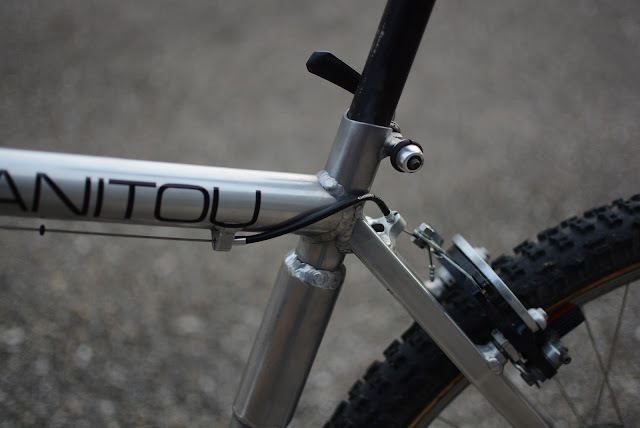 Another notable 'feature' of this frame is the sleeve on the seat tube. 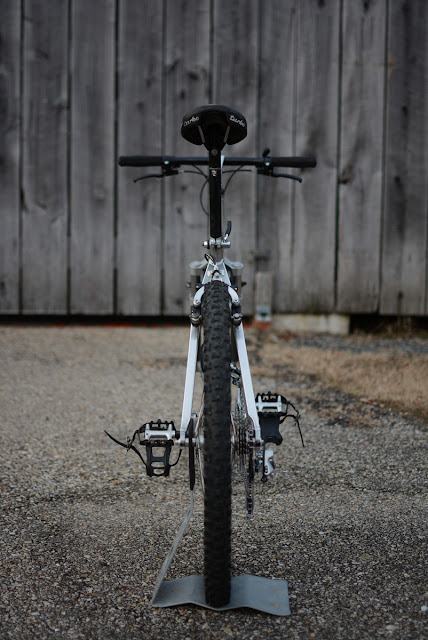 As Doug was experimenting with larger diameter tubing for his bikes he wanted ran into a lack of oversize seat posts. 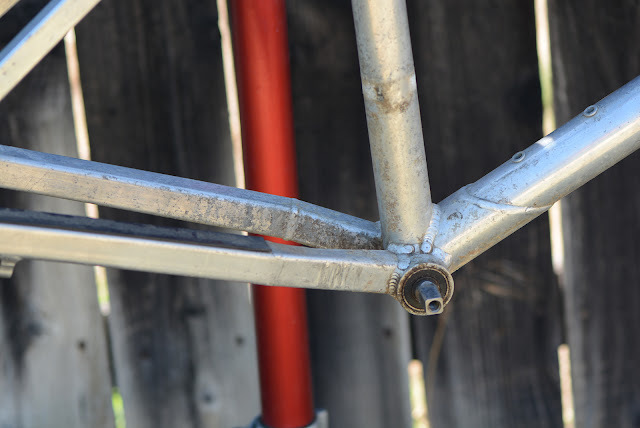 This mandated that the upper portion of the seat tube used small diameter tubing and there had to be a transition between the large and small tubing sections (as seen on another Manitou here). Initially the junction was down low on the seat tube and over time moved up until sometime in late 89, early 90 the entire length of the seat tube was 1 3/8 with only a small section above the seat tube necked down. This design proved to be problematic and of the three frames like this I've had all three were cracked at the junction. This particular frame must cracked a long time ago as Doug did the repair himself with a a large sleeve over the junction and the sleeve had about as much patina as the rest of the frame. This leads me to believe that the frame got a lot of use after the repair and so the quality of the repair is pretty good. 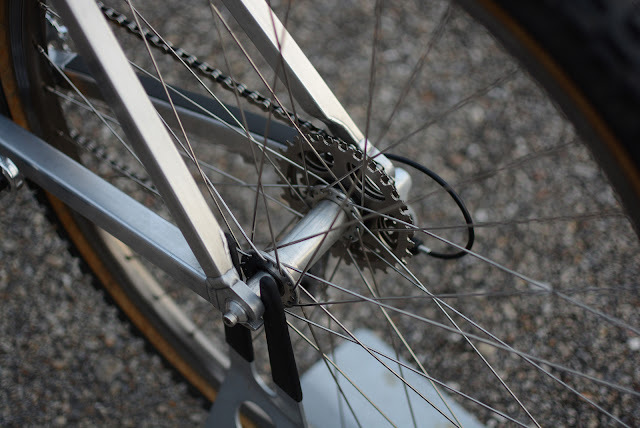 Heavy levels of oxidation and wear were all over the frame, but particularly bad on the BB junction. This early frame used box section tubing over the entire length of chainstay unlike the later bikes which used 1/4" plates at the BB junction. I've always liked this design for the amount of work it must have taken to build. The later design was simpler to manufacture and offered more tire clearance, but I feel this version is a bit cooler and more desirable. 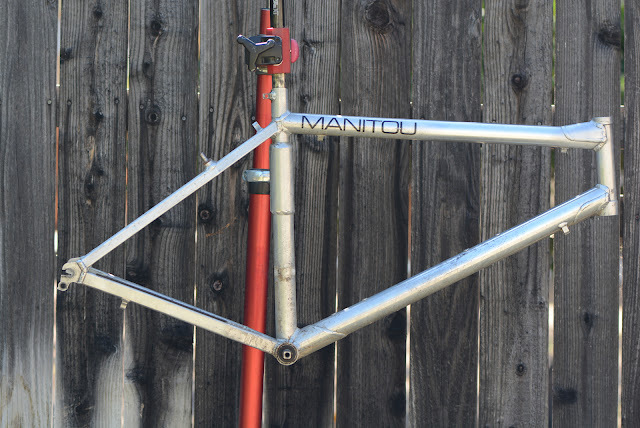 The pressed in bottom bracket on this frame is also a short lived feature of early Manitous. As Doug started experimenting with wide hubs (think boost) he needed a longer bottom bracket shell and spindle to accommodate the chain line. 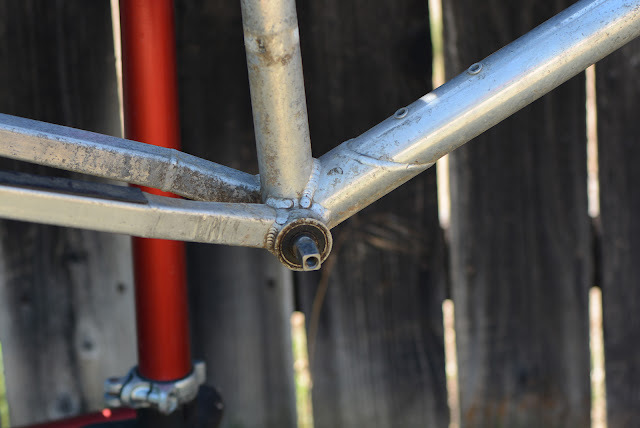 Nobody made wide bottom brackets suitable for mountain bikes at that time so Doug did what many other builders did back then and used pressed in bearings and and a long (145mm) tandem bottom bracket spindle. 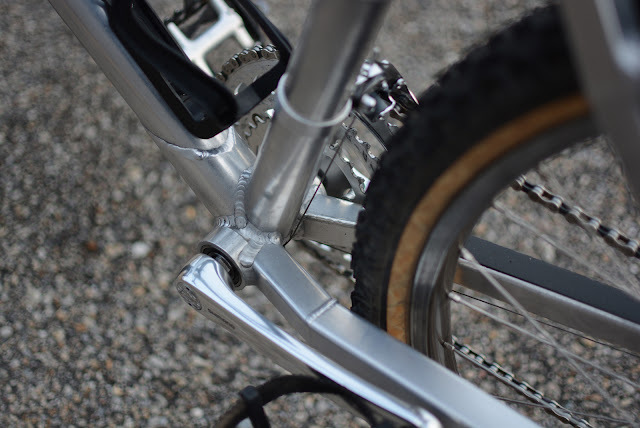 Some of his early bikes even utilized grease guard style bearings, like the ones used on Cunningham and Potts bikes of the era. The restoration of the frame involved mutliple levels of both mechanical and manual sanding and polishing over many many hours, but in the end I think the results speak for themselves. 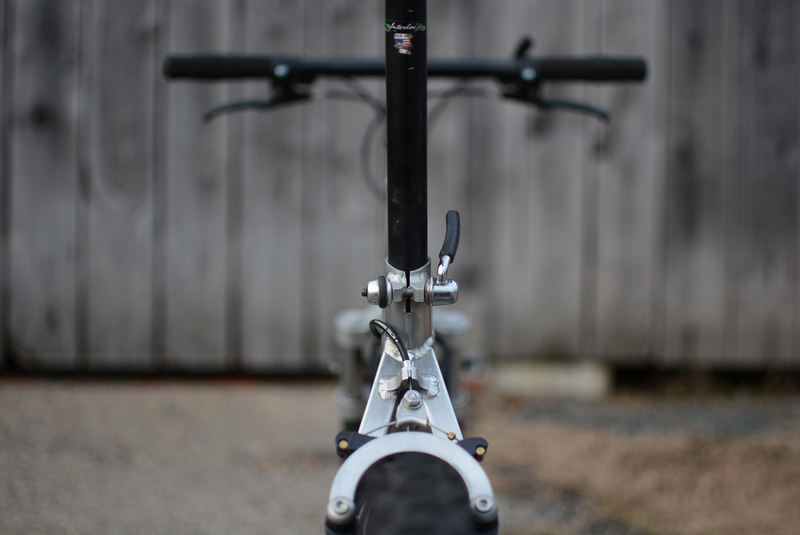 I initially built this bike with a rigid fork, but kind of liked the look of the first generation Bradbury fork and happened to have a clean example with wide spacing which I think looks great on this frame. As I mentioned earlier when I got the frame from Doug is bare, without any parts. I was lucky enough to get a cache of old wheels and hubs from Doug but only a few complete stems which I have long since used up. Given I had a few more frames to complete I decided to make some replica stems and that's what you can see on this bike. 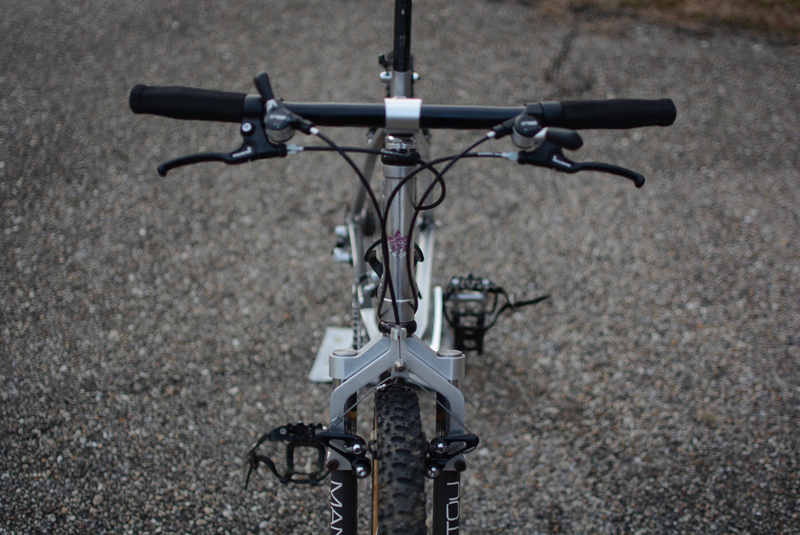 The stem is virtually identical to the originals made by Doug and I kept the cable guide allowing me to use either a rigid or suspension fork. 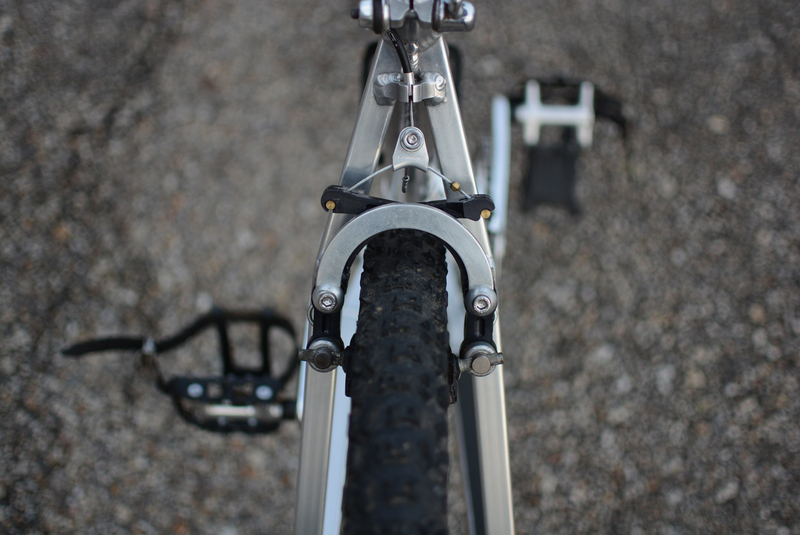 While the fork was in great cosmetic condition the elastomers had long since given up the ghost. I rebuild them using new elastomers from suspensionforkparts.net which work nicely and are the only way to revive these iconic forks. I really like these forks, they don't do much for big bumps and they don't offer a lot of rebound but they just make things fun. In my opinion they look cool, much better than an RS-1 and they are very reliable. 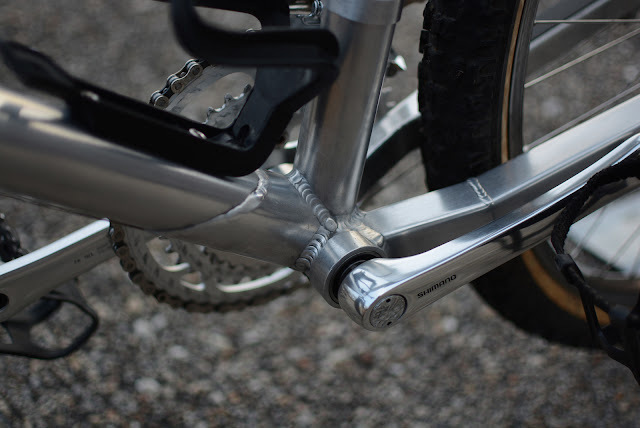 So, while it's undeniable that an RS-1 was a more complicated and probably high performance fork, I for one have never been impressed with one and they were rather unreliable often times blowing seals on long rides leaving you with a sloppy sack of oil for a front fork. That being said, I kind of feel like I should at some point do another RS-1 build, too bad I sold all my forks. 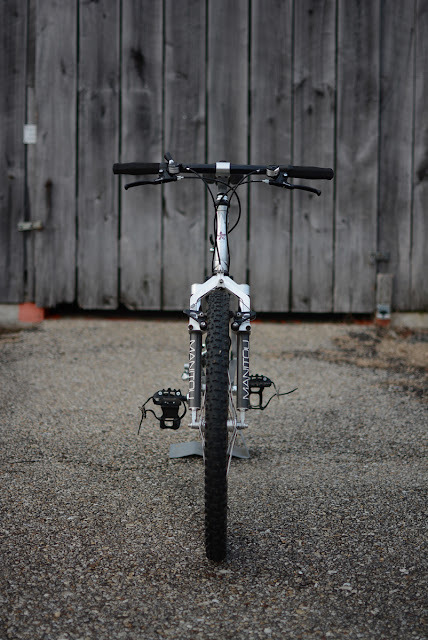 The front hub on this bike measures 115mm and was custom made by Doug. There were several variants of these hubs over the years. 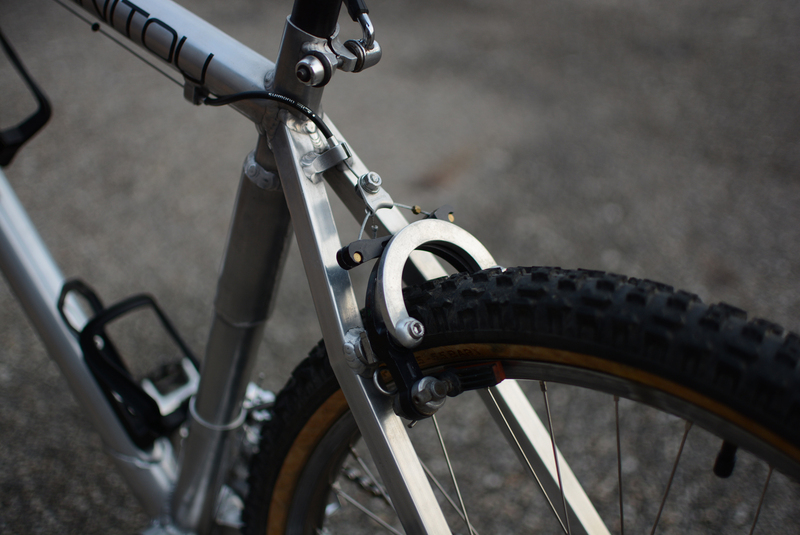 Early on Doug modified hi-e hubs with wider center bodies and longer spindles. Later on he started making his own hubs modeled after Bullseyes, again with wider centers and longer spindles. 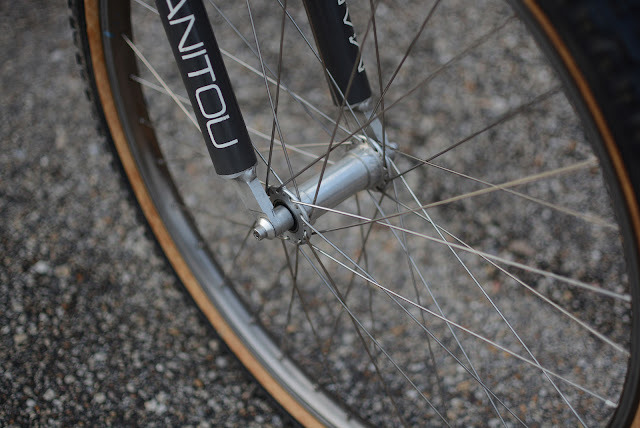 This enabled him to build stronger wheels to the point that a 28h front wheel was effectively as strong as a 32h or even 36h version. 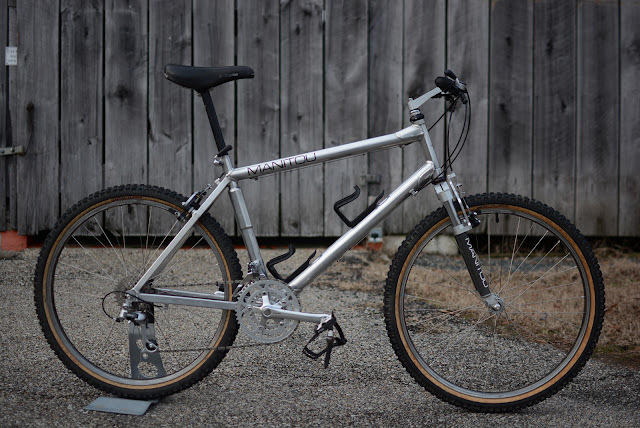 Having just recently completed the gray 1990 DBM with front and rear IRD Switchback brakes I feel like I could throw and IRD brake on the front here, but I'm not sure it would be right on an 89, I think those came out a bit later. 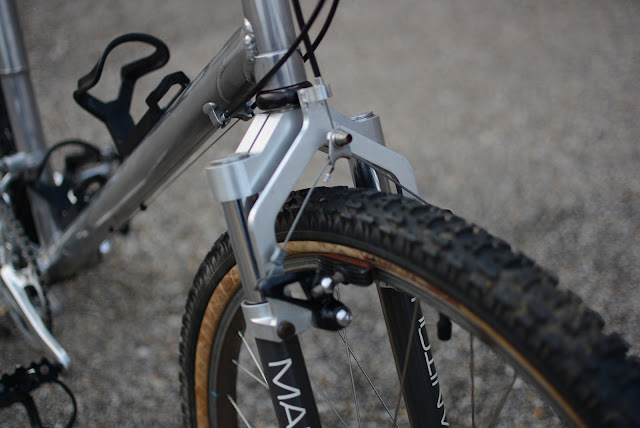 Still, the XT brakes while very functional lack a little bit of wow factor leaving some opportunity for future upgrades. 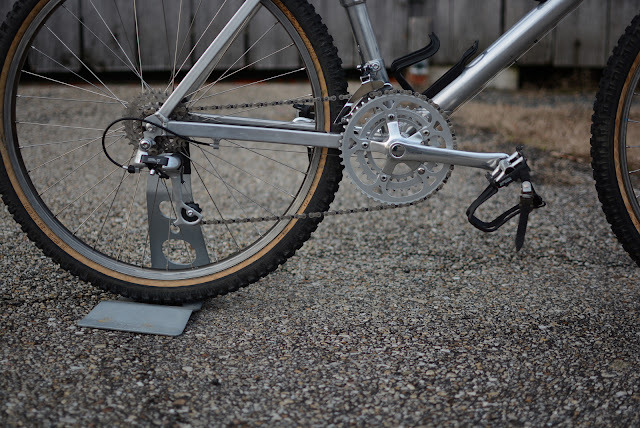 I only had some Grafton brakes around and given the U-Brake on the rear I'd have to break up a pair of them and I just didn't want to do that. The drivetrain is very basic 18 speed Shimano M730 XT, with Dia Compe brake levers which Doug seemed to like given how many pairs he had lying around and on bikes. The only thing I've been considering changing are the cranks as or maybe just swapping the chainrings for black ones, bike needs a bit more contrast, too much silver. I was just thinking that in reality I don't actually know if the frame is cracked under this sleeve, for all I know Doug did it as a preventative measure. Probably not, but still a fun thought exercise. Time to hunt for a boroscope. The rear IRD progressive brake features a custom made stiffener brace made by Doug for his bikes. Th photo above and below show my favorite bit on this bike. I can still vividly remember the layers of oxidation I had to remove and the polishing approach that cleaned the tubes while trying to preserve the details of the welds... This was quite a challenge but it feels great to have the frame look this good in the end. This little cable run is just fun, I don't know I love these little not well thought out add ons on these bikes. 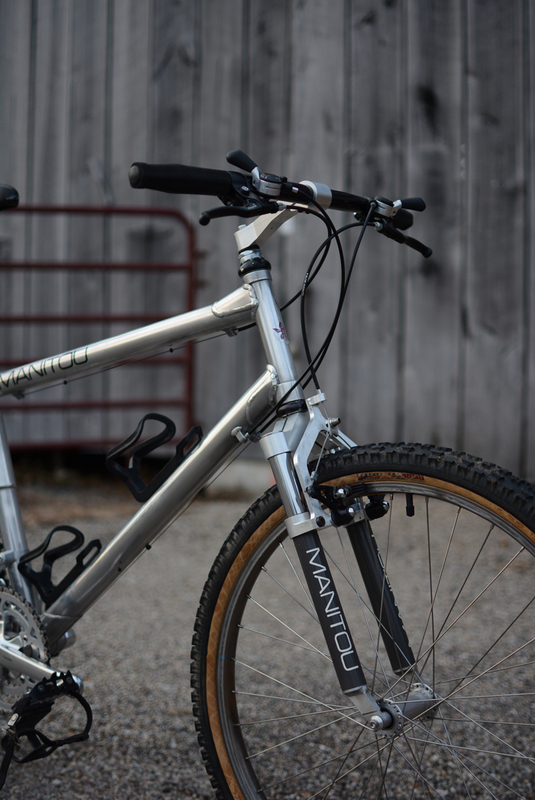 The cable routing on the early Manitous is all over the place, however by mid 1990 Doug had moved pretty much everything to the top tube and thee housing runs were cleaner and more direct. I'm sure I sound like a broken record at this point, but these bikes just look the part of a race bike. 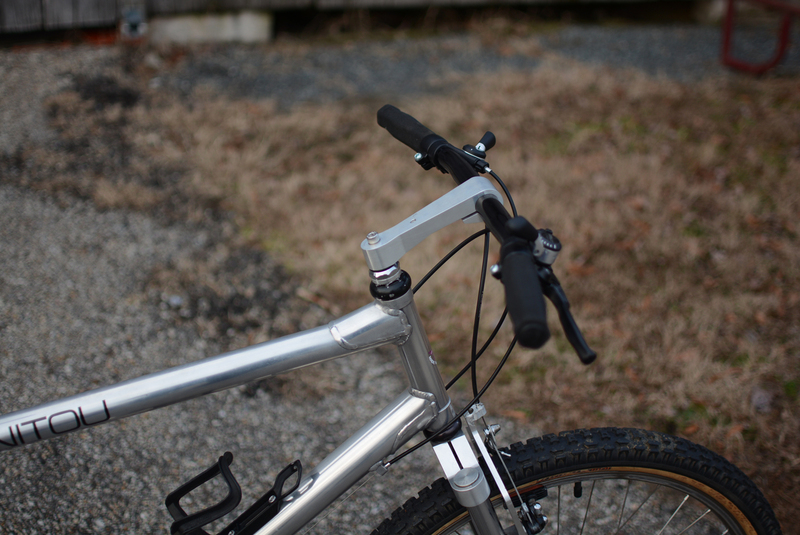 In the end that's kind of what I love most about this era of mountain bikes. If it looks fast standing still it's likely to be fun off road and nothing rings truer here. This bike, with its giant repair and all is still so freaking amazing. Take one part rugged trials bike, tack on some forward thinking technology and wrap it in a handmade package and you have what in my mind represents the reason why I am so passionate about vintage mountain bikes. 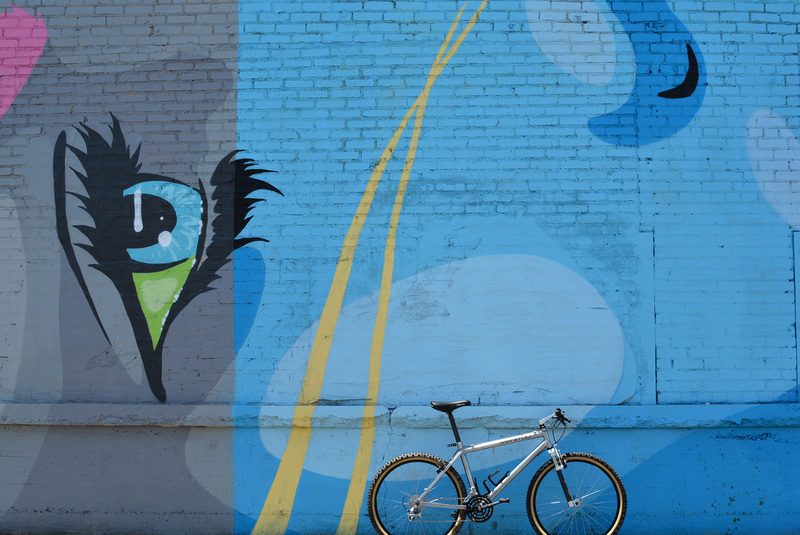 No fancy paintjobs, no crazy loud anodized parts just subtle performance for people who want to ride and explore. Period, end of story.